One of the MANY things I love about vintage fashion blogging is that I am constantly learning new things. In this past year and a bit that I've been blogging, I've learned SO much about myself, about photography, and about translating textual and visual examples of vintage style into real life. One of the things I've learned about myself: I'm certainly not perfect and not shy about admitting when I blunder. What joy would there be in denying there is always room for improvement!? Another thing I've learned: when I am passionate about something, I am incredibly tenacious and tireless in my effort to constantly improve and learn more! Example of something I've learned through blogging: several months ago I bought a lovely hat which a vendor had told me was from the early 1930s. I had seen similar hats in my 1930-31 books and magazines, so I felt it was a reasonably accurate dating. However, when I first had encountered the hat, it had been placed on a hat form with the low brim in front, making it look more like an eyebrow-hiding flapper chapeau. Still, trusting her judgment, I took it home and resolved to try it on with my various vintage dresses. Silly gal that I am, I even did an outfit post involving this hat and a more mid-30s dress. Even though my instinct was telling me something was a bit off about the way I was wearing it and/or the dress I was wearing it with, I had fun with the post and enjoyed the resulting photos enough to post them for all to see. Today, I was organizing my hat collection and happened to look inside this hat for some reason. I noticed that there was a seam that seemed to indicate the true front and back of the hat were in completely different locations from what I had been told and from how I had worn it. Oopsy!! Now, the non-purists among us would say "who cares?" and the fearless "try-er-on-er" in me says, "Hm! Interesting! Never knew that! Oh well! Live and learn!" HOWEVER, after poring over the elaborate rules and regulations set forth by the hosts of the annual Gatsby Picnic on their website, I thought I would mention this story because, apparently, had I sallied forth in the above ensemble to such an event, wearing an early 30s hat on backwards (gasp!) and with a mid-30s dress (double gasp! ), I would surely have been refused entry to the festivities. Possible textual proof, from the Art Deco Society of California's "How to Gatsby" fashion and accessories pages: "1931 Sears Roebuck Catalog - This illustration is a 1931 dress and what looks like a 20s hat. There was a brief transition between the flat figure of the 20s and the tailored 30s where you could wear a cloche (or cloche-ish) hat with the 30s silhouette. You may never wear a 30s hat with a 20s dress; the look didn't phase out that way." NEVER? Um, okay, fashion police. Sorry about that. Well, at least I didn't actually ever do a 30s hat with a 20s dress and in the case of my early 30s hat-mid 30s dress post, I could claim mild ignorance, but you get the idea. Some people are fussier than others about this kind of stuff. Personally, I have always found the 30s so fascinating and frustratingly difficult to mimick because rather drastic changes occur in almost each year of that decade. Anyway, I guess one of the morals of this story might be that if you are attending the Gatsby event, make sure to do your fashion homework or there MAY be fashion fusspots ready to accost you!! You think I'm kidding, don't you? :) One thing is for certain, you may find yourself being "classed" into one of the listed groups "beginner, intermediate, or Deco Diva," so if you want to be a "Deco Diva," be sure to check your ensemble before you Charleston your way out the door (disclaimer: I've never been to this event, so I am being cheeky here and going solely by the tone of the web info). There you have it. For all my baronial aspirations, I fear this faux aristocrat still has MUCH MUCH more to learn about the sartorial rules of yesteryore! Hey, that's okay! Right? Below is a photo of the hat that I believe is now worn the right way forward and with a more appropriate type of dress. I say appropriate because the capelet-ed dress I had worn it with was not only from the mid-30s, but it was more of a sporty spectator style frock, better worn with a MID-30s swagger type hat, whereas this early 30s straw hat seems better suited for wear with a similarly summer-y EARLY 30s dress like the one below. Whew... now if I could just get better at taking indoor photos....and if I could figure out WHY the fonts keep changing in this post. GA! of doing a thing. I had a similar hat experience, I bought a Parisian cloche which i thought was about 1932ish and have had it on the website for ages as that, but a couple of weeks ago i got it out and tried it on and it suddenly screamed 1961 at me. why didn't I see it before? it seems so obvious now. Oh my gosh, this post totally cracked me up!! Let me just say, OF COURSE they mixed eras of hats! Especially old ladies and women who who were of modest means. It was the Depression, after all. Old photos prove that to us. I attended the How to Gatsby one year and was HORRIFIED, absolutely HORRIFIED that they literally had photos of attendees from previous years with black rectangles over their eyes. They were dressed in a more costumey look than what's accepted. SO fascinating to hear from actual attendees. Thanks for these anecdotes, Trixie. I DEFINITELY want to go one year (poss. next year), BUT, as someone who majored in English lit and who taught Fitzgerald's novel MANY times, I find it more than a little ironic that there is this sort of elitism going on. Such things seem more in line with Tom Buchanan than Gatsby himself, who with his signature pink garb and his inability to be accepted into the NY circle due to suspicions not just about his gangster connections and business but due to his socio-economic and even ethnic origins (Jay Gatz), was the ostracized, not the ostracizer. BESIDES, the parties at Gatsby's house were described as ultra carnivalesque, lurid even, full of ostentation. WHY would the Gatsby picnic try to stifle that? I guess they're not going "by the book." Miss Rayne: yes, yes! this sort of thing has totally happened to me before while selling also! I'd LOVE to hear from others, so keep the comments comin'!! Ugh, I'd be really put off attending any event with stuff like that on their webpage. That kind of elitism is absolutely uncalled for :/ They are probably the same group of people who are horrified when vintage-inspired clothes come back into fashion, because it means that their look isn't so exclusive anymore. This is something that drives me bonkers sometimes with vintage people and why I love candid shots from the 30s and later. People like to forget that the 30s was full of REAL people, just like today, not just movie stars. You bought a hat in 1932, it didn't mean you threw it out in 1934 when it wasn't "trendy" anymore. Sure some people did, but the vast majority, especially in the Depression, did not. A basic black hat for example would probably have been worn until not serviceable any longer, or passed on to kids who then wore it as it was Moms hat. Same thing as today when I ran around in a 70s dress my mom shortened for me in the late 90s. The entire Flapper movement shows that people were still allowed to be rebellious when it came to fashion, as do Teddy Boys/Girls (as someone posted about earlier today). Same goes for hairstyles, shoes, etc. Not everyone had their hair bobbed in the 20s! Not everyone wore high heels in the 30s and 40s! Hmmm, I'm not sure I understand this attitude from these event people. A couple posters have already mentioned this, but it seems impractical that there was absolutely NO mixing of clothing and fashions, especially if you're talking early-30s to mid-30s. Not everyone can afford to be completely on trend all the time! Even today, that's an issue. Great post! I think both of those outfits are adorable. I've been to Gatsby, and if it weren't for the fact that my future husband was there holding my hand the whole time, I probably would have wanted to kill someone. I was really shocked by how snotty people are in that crowd. Get over yourselves! What a great story! I'm a non-purist and think you can mix whatever you like if you think it's looking good. Ofcourse I have never been to the Gatsby event, but I stumbled upon it a few years ago in search of 1920s inspiration when I had a likewise themed party. I loved the whole idea of this afternoon. Maybe their information on clothing could be regarded as mere guidelines and a source of inspiration and not as laws. Even on their website they recommend a modern dress from Amazon! Which hasn't that 1930s feel to me at all. I guess they want to avoid the horror of people turning up with fringed nylon minidresses, feathered boas and fishnet stockings. Or to prevent people turning up in their casual sportwear as gazing spectators. I guess it makes the event special and magic if everyone makes some effort, within their possibilities. Ofcourse there will be snobbery from purists. You'll have them anywhere anytime. I wouldn't care so much. Maybe one could even enjoy their looks and effort to get it right. Take a look at the many photographs of past years and you see that not everyone is that strict and appropriately dressed. You will note many flowered dresses that look very 1990s to me, modern shoes and any kind of hat (some could be 1970s) or the odd 1940s outfit. But it is not bad, bad is the costume flapper, I really despise that look. The way you dress as we can see on your blog would fit in perfectly, even with you hat backwards! God bless the vintage snob and all those who sail in her! together just as we mix and match now. I bought a 30's sunhat on ebay and wasn't wearing it right it was Mr M that said "Hey you, these bits are supposed to hang like this!" I wanted to fall over laughing, I just hadn't seen what he saw! But he was perfectly correct. Seriously, though, I too love the idea of people dressing up in vintage and having a day with other people interested in vintage. However, the tone of that website might need to be revised if they don't want to give off the impression that people are judging and classing each other based on their outfits at this event. The fact of the matter is that it takes MONEY to get a top to toe "authentic" look. 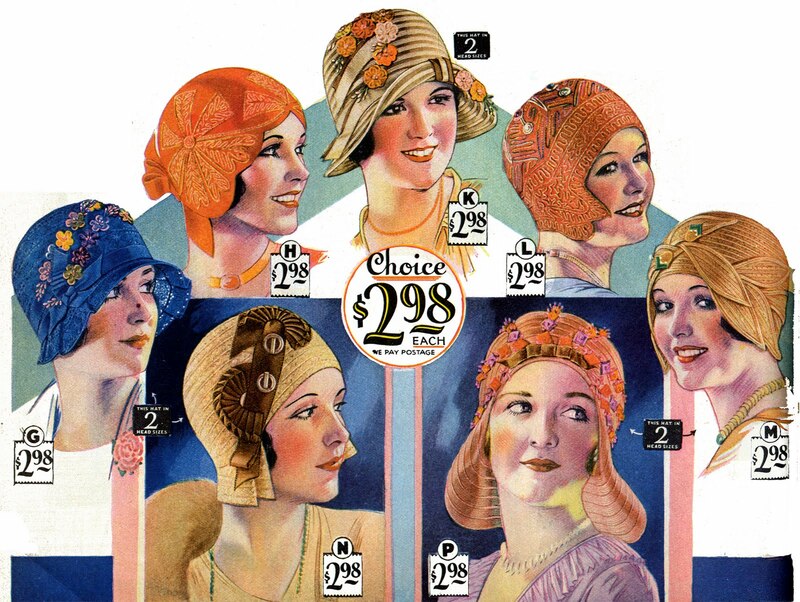 1920s hats and dresses that are not in tatters and that could stand a day of wear are more expensive than items from almost any other decade. Authentic shoes in wearable sizes are scarce and also pricey, so even though they link to an Amazon site for a dress, the implication is that only those who have the luxury of access to proper vintage gear will be able to embody the "Deco Diva" look. Or at least that was my sense. I think it's the "Accessories" page of the Art Deco site that is really getting under my skin. The word "NEVER" (as Wearing History points out) is a slightly dangerous one to use. It makes me want to find exceptions to these supposedly hard and fast rules. AGAIN, we're dealing with this false assumption that at the GATSBY picnic everyone should be attempting to emulate a rather conservative and ladylike upper-class look, when in the novel the East and West Egg people looked and acted VERY differently. Why does everyone have to look like Daisy Buchanan? Here are some little examples of my favourite parts of the "accessories page" "Without accessories a dress is just a dress, more importantly without accessories and lady is not a lady. Women in the 20s and 30s never left the house without hat, gloves and handbag." The cloche (a French word meaning bell) is what we think of for the '20s. They have come back, a bit, in popularity so it is possible to get one new - if you have a small head. The cloche is meant to be pulled completely over the head and down to the eyebrows, giving the wearer a charming coquettish look. If you have a large head, good luck. You can always try a scarf if you can't find a hat that fits. The cloche is not a look everyone can pull off." I quote: "Preparing for Gatsby is fun; a vintage treasure hunt filled with great finds and discoveries. We've provided this information to assist and educate. In these pages is not just what to wear, but a little insight as to how people lived." WHICH PEOPLE? They note that "Although we admire perfection, one should never offer free-lance criticism of what others are wearing. They are doing their best. This was a faux pas 75 years ago, and it's still bad manners today. Admiration, on the other hand, is cheerfully accepted!" HOWEVER, they go on to list a series of very detailed rules that scrutinize every element! I QUOTE: "We have people at the gate to deal with those few unfortunate souls who turn up in unabashed contemporary wear: jeans and t-shirts, athletic shoes, shorts, baseball caps, flip-flops, short-sleeved open-necked shirts on men or modern pantsuits on women. Our Costume Closet offers emergency rental assistance." Okay, fine no people in flip flops. BUT why can't a Marlene Dietrich type come in wearing a pant suit? DO you know how hard it is to find authentic pant suits? What if it is a vintage inspired one? "Shoulder straps had not been thought of yet. So if you are shopping for a modern bag with a vintage look, be sure you have a way of hiding or removing the shoulder straps." "While gentlemen preferred the look of dark hose, women refused to go along with them. Ladies wore pale colored stockings made of silk or rayon. These fabrics had a light sheen and a tendency to bag a bit at the ankles. Cotton and wool stockings still existed but were not considered fashionable. All stockings had seams." SO, the goal here is again to appear like a monied, "Fashionable" woman of the 20s or 30s. HOW is this a realistic portrayal of how "REAL people" lived in the 20s and 30s. This is a distortion of historical fact. Reminds me of My Man Godfrey. Let's forget about the Forgotten Men and women. "Warning! There is a trend these days for contrasting seams - this is not period at all. Women of the Jazz Age longed for stockings without seams, but had to wait until after World War II for technology to deliver them. They would not want stockings that accentuated the seams. Please, no fishnet stockings. These were worn on the stage only and would've been considered bizarre with regular dress." SERIOUSLY, you want people neurotic about whether they have the right seamed hosiery! "Heels should match the material of the uppers. Stacked heels do not make an appearance until the late 30s. Toes are rounded with the exception of the early 20s when they were pointed. Square toes? Never ever." ahem. wowee, I went off here. My final point: yes, it's meant to be a rather posh event, so the rules of etiquette are more restrictive. Fine. Just don't try to tell people that the way they are representing "true" 1920s and 30s manners of dress is reflective of the way ALL men and women actually dressed (or lived). As I've shown in the excerpts above, clearly, they are attempting suggest such things. They are inferring that all people who attend the picnic should dress like LADIES (upper class). I again must emphasize that this runs completely contrary to Fitzgerald's novel that is the namesake of this event. It basically perpetuates the sorts of elitist exclusionism which the novel thematically critiques and reveals as hypocritical. In short, I'm disappointed that this is a GATSBY-themed event in look but not in substance. I'm not saying I would never attend. I'm saying I can predict how I would end up feeling and reacting against such codified rules and regulations related to stocking seams and shoulder straps--I would probably rebel. I would DELIBERATELY do and say unladylike things, just as flappers bobbed their hair and did other audacious things in order to go against "polite" society. IRONIC that they are telling people to bob their hair for this event because bobbed hair may have been "fashionable" but it was not considered "ladylike" by all social circles in the 20s and 30s, so to say this is an "accurate" reflection of how "people" lived is flawed. You get the idea. I've got a baronial bee in the bonnet. Hahaha, okay I get your point, it is hilarious. Organisers of vintage events could ask kindly to make some effort. But all should be reasonable, from all sides. that was a great post. Thanks for the link. I'm not disagreeing with the idea of ensuring the event is populated by people who are making some attempt at going for a vintage look. It would defeat the purpose of the event if everyone just came in modern day casual wear. That should be a given. I was just getting frustrated by the nitpicking in the "How to Gatsby" guide regarding the minutiae of the "Gatsby" Look/style that they are promoting as "authentic." Is it seriously a problem if someone shows up to the event NOT wearing seamed stockings (or any stockings at all)? Are they really telling people they must only try to go for a high society "lady's" look and not the look of a 20s chorus girl or an avant garde trouser and fedora wearing dame? According to the guide, YES. Gatsby came from very poor, humble roots (which he tried to suppress). Why not have fun with this idea and say that people can come in more humble dustbowl era garb if they want? I guess I'm being nitpicky too, in that I don't think it's fair to be stating that the Gatsby picnic and its fashion rules are an accurate reflection of how all people lived and dressed in that era. That is simply not true. Moreover, maybe they can ease up just a smidge on some of the smaller details (or at least maybe they should try to reword sections of those parts of the website). Example: Don't tell people that only a few people really look good in cloches. Who says? In the end, I would rather see someone in a cheap flapper costume having the time of her life than someone in jeans and a t-shirt. I'd also rather see a flapper in costume charlestoning and ripping it up than some stodgy period-perfect person just sitting in the corner judging everyone else. If you let both groups into the event, I really do think you'd have an event that is more in line with the Gatsby parties described in Fitzgerald's book. I've seen ads in late 20s magazines for seamless stockings. Those Gatsby clowns, of course there were unseamed stockings before the war, thats WHY they baged at knees and ankle BECAUSE they werent fashioned. I wonder if they turna way people wearing nylons which is what contrasting seams are usually applied to? Loved this post! Hehe. I don't really like anything that hints at elitism (though, I do have a touch of the purist about me, I'd like to think it's not in a snobby way) - it takes all that fun out! I'd be far too nervous to turn up after reading those 'suggestions'. Besides, I'm not sure I wouldn't look a bit silly in 20s clothes. I'd rather wear 20s mens clothes. I wonder if people are allowed to come in drag? ;] Hehe. Also, I'm always putting hats on the wrong way. Even modern hats that have bloody labels in them! Haha. ANDI, I swear to gad, they specifically prohibit women from coming in drag (no pantsuits or fedora hats on women, say the rules). GAck! Oh, for the record, I have a little bit of the vintage purist in me...but just in terms of the fact that, whenever possible, I prefer to wear authentic 30s items, as opposed to vintage inspired or vintage repro (though I'm definitely more into vintage repro/bespoke than I ever was before). Unless someone is claiming to look top to toe authentic and I notice clear errors that jar against my own research or knowledge, I really don't give much mind to what other people are wearing (though I'll admire others for their creativity, their ability to create what I consider a beautiful or nice look, etc). I think if I was better at making vintage inspired items work for me I WOULD wear them more often, but modern clothing rarely fits my body. Skirts are always too short, dresses usually too clingy in the wrong places and too short, modern pants not cut with the right curve and the rise is always too short. When I was working at the Opera I'd wear 30s pants I made all the time. I was told I "made them wrong", and that the rise was "too long". HA. The cut was just sooooo different than modern pants.